Synchronization— If two or more than two alternators are operated in parallel, then they are known as synchronized Alternators; and, the process of operating two or more alternators in parallel is known as synchronization'. (I) The terminal voltage of both the alternators should be the same. (II) The generated frequency of both the alternator should be the same. (III) The phase sequence of both the alternator should be the same. The first condition is fulfilled, by adjusting the series field regulator of the alternator. The terminal voltage of the first alternator is made equal to the terminal voltage of the incoming alternator, by regulating the field excitation. The second condition full filled by adjusting the speed of the first alternator at it prime-mover. The third condition is fulfilled by connecting the R, Y, and B ( Red, Yellow, Blue) wires of the incoming alternator, to the R, Y and B wires of the running alternator. the sequence of R, Y, and B is termed as phase sequence. When the wire R is at maximum e.m.f. then Y will be at somewhat higher and B at somewhat lower e.m.f. with respect to the e.m.f. of R. If the wires of running alternator are not in proper phase sequence, then their sequence can be corrected by interchanging any two loads. What Is Dark Lamp Method? 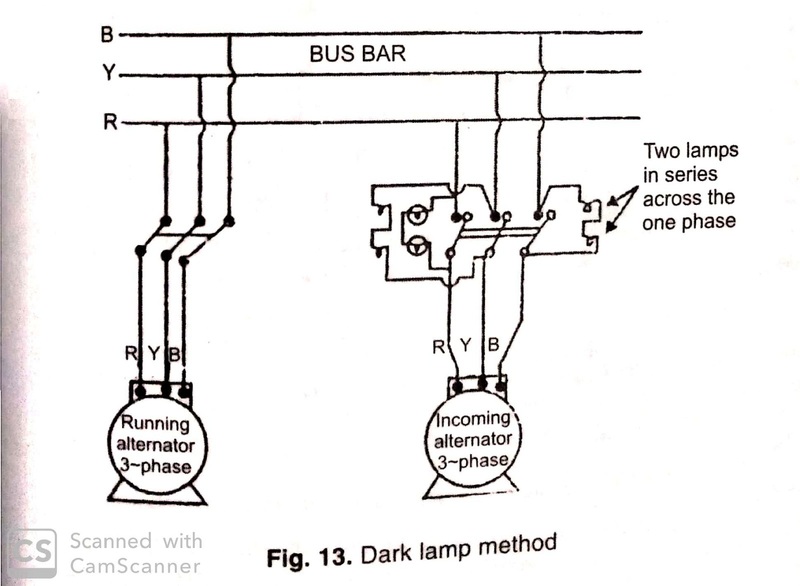 Dark lamp method— in this method, three series pairs of lamps are connected across the terminals of the main switch of the incoming alternators as shown in figure 13. 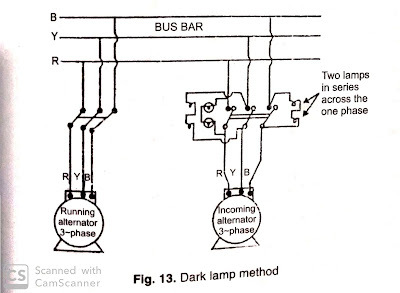 One lamp pairs are connected across each pole-pair of the main-switch, which connects the incoming-alternator to the bus-bar. Now, the incoming alternator is operated, and the light intensity of the lamp will indicate its proper phase-sequence, frequency, and voltage. If the lamps glow bright and dim alternately, then it indicates a difference in the frequency of two alternators. The frequencies are equalized, by adjusting the speed of the incoming alternator at its prime mover. when their frequencies are equalized, then all the lamps start to glow Bright or dim, but continuously. 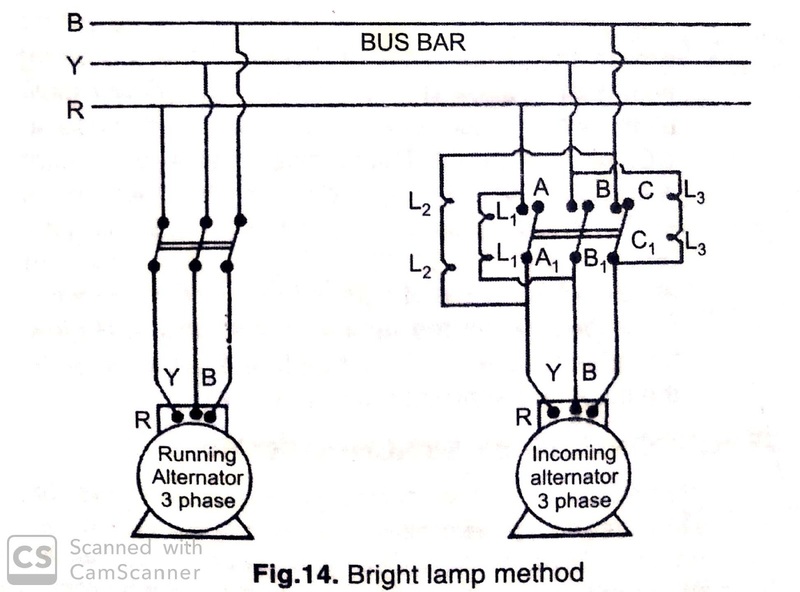 if the lamps get dim in a random sequence, then it indicates that the phase rotation of the incoming-alternator is opposite to that of bus-bar. the rotation is corrected by interchanging the connections of any two leads. When all the lamps get an offer to become dark, then all the synchronizing conditions are understood to be fulfilled and the main-switch of the incoming alternator is put to ON. › The lamps do not show that the incoming alternator is fast or slow. › It is difficult to judge the middle of the dark period. › This method is outdated now. What Is Bright Lamp Method? 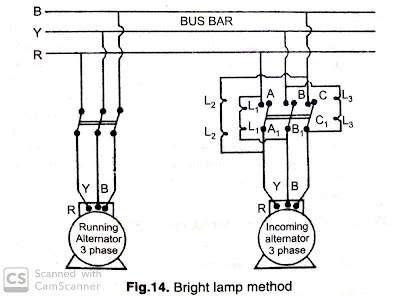 Bright lamp method— in this method, The running alternators is connected to the bus-bar through a main-switch. 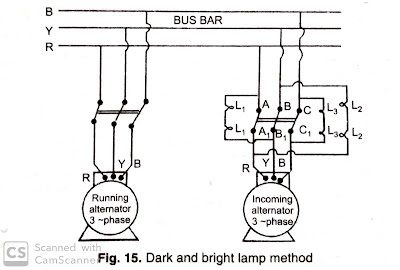 the incoming alternator is connected to the bus-bar through another main-switch and three series pairs of lamps are connected at AB, CA, and BC, terminals, as shown in figure 14. Now, the incoming-alternator is operated by its prime mover, if it is faster then a flickering lightwave will rotate in an anticlockwise direction. and if it is slow then the flickering light-wave will rotate in a clockwise direction. for a difference in frequencies of the two alternators the lamps will flicker together, and four equal frequency the lamps will glow brightly equally. if the voltages generated by the two alternators are not equal then the lamps will glow dim, the more is the difference in the two voltages the less will be the brightness of the lamps. As the two voltages become equal, all the lamps will glow brightly equally. when all the lamps start glow Bright equally, the main-switch of the incoming alternator is put to ON. What Is Dark And Bright Lamp Method? , A1B and CC1 terminals as shown in figure 15. The incoming alternator is operated by its prime mover, the lamps start to flicker. If the incoming alternator is slow, then the lamps at A1B will glow blight, while those at A1B glow dim, and those at CC1 will glow brightly. Thus a clockwise wave of the light is formed. If the incoming alternators are fast then lamps at AB1 will glow dim, while those at A1B will glow bright, and those atCC1 will glow dimly. Thus an anticlockwise wave of light is formed. 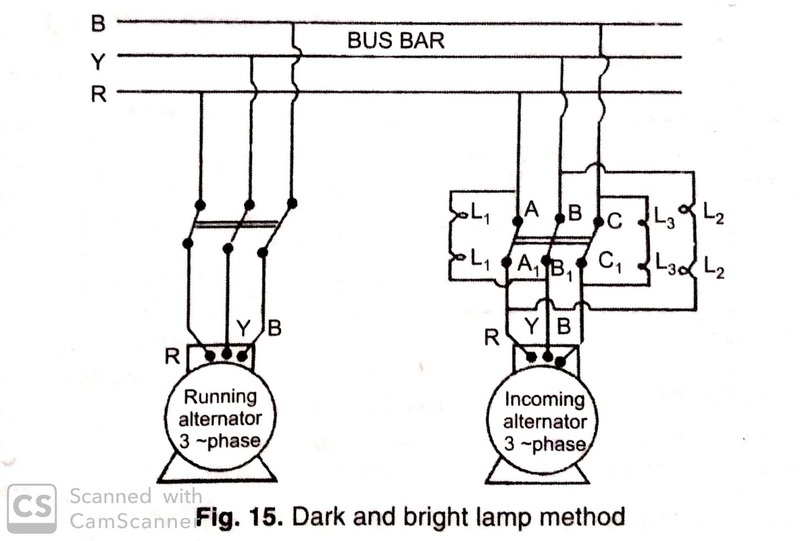 On adjusting the speed, when the lamps at AB1 and A1B glow bright and those at CC1 get dark, the main-switch of the incoming alternator is put to ON.